Product prices and availability are accurate as of 2019-04-07 15:15:09 EDT and are subject to change. Any price and availability information displayed on http://www.amazon.com/ at the time of purchase will apply to the purchase of this product. 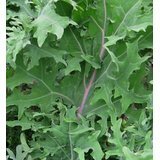 This is a pack of 100 seeds of Red Russian Kale. Tender oak-type leaves are green with reddish-purple stems. A very flavorful heirloom variety. 65 days At TomatoBob, we have been growing and selling open pollinated, heirloom seeds for over 15 years. We specialize in over 350 varieties of heirloom tomatoes, but also offer lots of great vegetables and herbs.